1. Big Circles. Stand with feet shoulder-width apart and knees slightly bent. Hold medicine ball in both hands, above your head with arms extended straight. Rotate your arms clockwise without bending your arms, all the way around in front of your body as if you are drawing large circles. Complete 12 circles in one direction and 12 in the other. 2. Overhead Throw. Hold a heavy medicine ball with your hands positioned so that your thumbs are pointing at your chest. Bring the ball up under your chin so that your thumbs are now pointing at your neck. This is the starting position. Begin exercise by squatting down and throw the ball straight up in the air as you come out of the squat. Throw the ball as high as you can and jump slightly off the ground as you throw the ball. Let ball hit the ground. Repeat exercise for 30-60 seconds. 3. Ball Slam. Stand with your feet shoulder width apart. Bring medicine ball above your head with arms slightly bent. Begin exercise by reaching back as far as you can, then swing arms forward and slam the ball against the ground in front of you as hard as possible. Catch ball as it bounces off the ground and repeat. 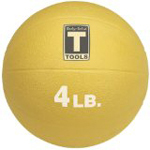 Slam ball as many times and as quickly as you can for 45-60 seconds. 4. V-Ups. Lie on your back on the floor. Hold your medicine ball and raise arms backward until they are flat on the floor and above your head. Arms and legs should be straight. Next, raise feet up about an inch off the floor and hold. This is the starting position. Begin exercise by simultaneously raising your torso and legs up as you try to touch the medicine ball to your feet (your torso and legs will form a V-shape). Pause for a moment, then lower back down. Bring ball back above your head. This completes one rep. If this is too challenging, bend the legs. Do 12-15 repetitions. 5. Single Arm Push Up. 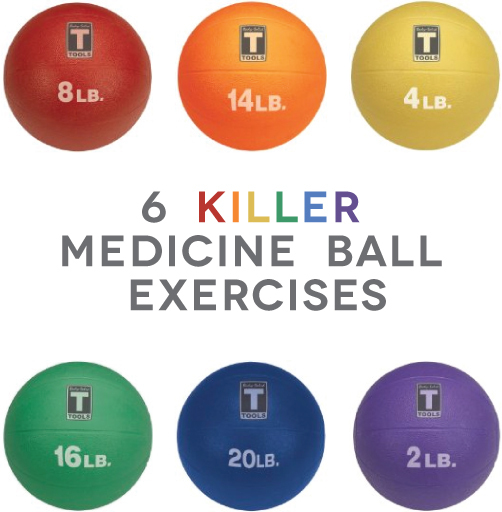 Place medicine ball on the ground. Assume a standard push-up position with medicine ball under chest. Place your left hand on the medicine ball while leaving your right hand on the ground. Begin exercise by lowering your chest until it is few inches from the ground while keeping elbows tucked into sides. Push up off the ground as quickly as you can. This completes one rep. Perform these on your knees if necessary. Do 12-15 repetitions per side. 6. Wood Chop. Hold medicine ball with both hands. Stand with feet just beyond shoulder width apart. Raise arms up above head. Begin exercise by bending forward at the waist while swinging your arms down between your legs and squatting down. Swing arms as far back as you can between your legs while keeping them straight. Reverse movement back up to the starting position. Do 12-15 repetitions per side. Enjoy! And be sure to consult your physician before starting new fitness exercises if you have any concerns or existing injuries!